Another "reevaluation hearing", strikingly similar to Wednesday's Real ID hearing in Washington, took place the previous week [7/8]. U.K. national identity resisters, No2id, report from across the pond. UNITED KINGDOM - A House of Commons [comparable to the U.S. Senate] debate took place July 8th on ID card regulations and legislation. The House of Lords [comparable to House of Representatives] greenlighted draft legislation for The Identity Cards Act of 2006, passing regulations. They simltaneously kicked the can down the road Monday for regard of public input, leaving it up to a change of the guard. They released this statement, "That this House regrets the Government's decision to proceed with the draft Identity Cards Act 2006 [...] Regulations 2009 before the case for continued investment in the identity cards project has been put to the British people at a general election". Shadow Home Secretary Chris Grayling MP said, "We might be in a position in which, in order to allow people to travel to the United States, we need to process biometric data and to pursue the introduction of biometric passports. We have not backed away from the biometric passport option [...] However, it is not our intention to proceed with a compulsory national identity register". "I am not sure that I would accept that it is necessary to store biometric data. After all, the document would have the biometric data and it is anadditional guarantee of veracity. Why is it necessary to go one step further and store it centrally?" One question that neither the backers of Real ID nor of Pass ID have adequately answered is: If this law were in place before 9/11, would it have prevented the attacks? Given that terrorists would still be able to steal or forge identity documents, or even obtain them legally as many of the 9/11 hijackers did, the answer is almost certainly no. Legislation to create a federal ID card is an expensive, intrusive boondoggle that should be killed. 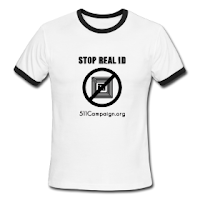 With no debate, the Senate in 2005 approved the Real ID Act: H.R. 418: -- which had been inserted into must-pass legislation authorizing funds for the Iraq war. That may have been the only way to get the deeply controversial law through the upper house, because of all the heightened security measures passed following 9/11, none will have as dramatic and intrusive an effect on the lives of everyday Americans as Real ID. It was refreshing to hear Sen. Joe Lieberman say, "We are not surprised to see that we are here today." The Real ID Act passed without a debate, eluding due process. States were then asked to absorb the costs of inadequate technologies which would not protect them. Consequently States resisted the costs and dangers of incorporating the legislation. DHS is appropriately back to the drawing board. 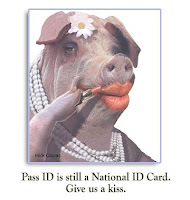 Senator Collins' opening statments outed that the PASS Act does not repeal the Real ID Act but refines it. The 9-11 Commission recommendations continue to propell the PASS Act in lieu of the Real ID Act. Senator Joe Lieberman relished "rubbing it in"; as the Real ID Act's passage and subsequent failure also repealed his 9-11 Commissions identity work in the Intelligence Reform and Terrorism Prevention Act of 2004. Lieberman observes, like many in Washington, to corporeal ignorance and detriment, the 9-11 Commission report's ability to grant legislators super powers. The report's role in 2009 has been reduced to a Reichstag fire poker for disaster capitalist beggars, filled with mysterious humanity driven omissions. The U.S. government expects Americans to swallow whole any agenda kicked down over the 9-11 Commission report, based in fact or fiction. One such agenda is the acceptance of a national identity based on 9-11 hijackers lawfully present in the U.S. on temporary Visas. In today's Hollywood, Americans can't afford to sponsor Lieberman's tickets to Fantasy Island. States will continue to fight The Corporation over the appropriations they are expected to spend to surveill identity. They simply need it for other things. Senator Akaka made an amazing point of asking Stewart Baker, consultant for former DHS Secretary Chertoff's national security firm, about the top priority of order for expensing machine readable zone technologies [bar code, RFID, biometrics] over the stack of disaster preparedness needs. Even if no one asked us, we think the Senate should take the RFID & biometrics budget and reroute it to ready the Gulf Coast for the next hurricane season, instead of dragging out man-made disasters like the Real ID Act. BTW...Chertoff has been known to have personal investment stock in the biometrics game. He has much to lose if the PASS Act cuts both the RFID and biometrics tech bids. 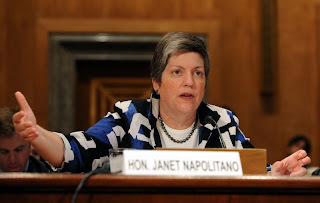 DHS Secretary Napolitano became an unlikely champion of pragmatism. It was so great to hear that Real ID was "D.O.A. ", going nowhere as long as at least 13 states had passed laws against it. She was the first to reveal a very strong reccomendation that States needed more time and would be willing to find their own paths to securing their licenses from pilot programs included in the PASS Act. Unfortunately, she too stays employed by sticking to the 9-11 Commisssion report as the rule book. Senator Voinovich eagerly defended the PASS Act as the solution to ease the stand off between State governments and the federal design for identity. Before excusing himself to attend to an amendment, he projected that the PASS Act creates an opportunity for federal legislators to "get it right the second time". Not everyone in Washington D.C. insults public intelligence. Happy Birthday, Senator Voinovich. Akaka, Lieberman & Voinovich stated,"Let the perfect, not be the enemy of the good." What didn't make it into the hearing was a discussion of a repeal effort, dispatching rule making capability to suspend further implementations and costs of standards by States, and head-on dealings with the role Real ID has played in States' immigration games. States like California, have put their Real ID bills on on the back burner until federal regulations over identity are settled. California Senator Ed Cedillo has been pushing legal identity for undocumented workers for over 10 years. For Cedillo's supporters the Real ID Act seems to be a tangible federal mandate able to escalate American identity for millions of immigrant workers in Southern California. Conversely, Texas who shares the largest border with mainland Mexico, projects demands for tighter immgration control onto the Real ID Act in hopes of weeding out unlawful identity. As Real ID exists, neither state will see deliverance. Senator Kay Bailey Hutchison's [R-TX] office alluded to a separate hearing and discussion about Real ID, apart from yesterday's hearing addressing immigration regulation. This might include border fence legislation ; the crossroads of citizenship, U.S. identity and current U.S. labor demands. The PASS Act's notion of States creating pilot programs to explore better performing identity security pursues a manageable direction for state governments. Napolitano mentioned the Mississippi program available to 13 states to test certain technologies. The prospective darkside for States is the predatory corporate prescription of surveillance products endorsed by the federal government; whether they actually perform or not. Smart states who rejected Real ID outright, like Idaho & Montana, may shop for better technologies on their own. DHS consultant, Stewart Baker, stuck to regulated mandates that States pay their own way for secured licenses. Napolitano pointed out States made recommendations for secured licenses on their own of what will work for them. What didn't surprise was the fact that National Sherrif's Association leader, Leroy Baca, of LA County Sherrif's Department supports whatever work is put in front of them to do. The PASS Act was no exception. The police will surveill whatever the government wants, as long as it's the law and they're ordered to protect it. What did surprise was the fact that there really wasn't a national standard to provide citizenship to attain a license prior to Real ID. Amid the echoing redundancy in Real ID regulations, it was miraculous that this fact managed to surface. At least 10 states, mostly on the Canadian border, had not required proof of lawful residence in the U.S. in order to attain a license. Many police officers and citizens alike have taken for granted that in order to attain a State issued identification, a cardholder has jumped through necessary hoops to prove identity. If not, then you don't complete the American rite of passage. Again, Ari Schwartz exposed that internal fraud on the part of license administrators is one of the chief causes of identity theft. I think the word "immigration" was not mentioned once, with the exception Senator Akaka's questions to CDT's Ari Schwartz over the E-verify program. The contrasts seemed an acceptable rabbit trail to explore during the hearing, according to on-site reps for CATO Institute and the ACLU. Things took a sharp turn with Senator Roland Burris' starkly strange and awkward questions about propelling National ID cards and the needs of TSA directed chummily at Secretary Napolitano. Many were as unsure of Burris' questions as they were answers given by Napolitano. CDT's, Ari Schwartz recovered and revealed much of the lost ark of privacy, carrying the silent concerns of privacy and civil liberties advocates in the hearing audience. The "machine readable zones" on licenses were still played down, as no one was courageous enough to mention or even inquire about RFID tags, biometric or any other manifestly WHTI compliant technologies. We believe that is the trade off absorbed in the PASS Act.